HCM City (VNA) – Ho Chi Minh City needs a particular mechanism in order to fulfil its role as an economic locomotive of the country, Politburo member and Secretary of the municipal Party Committee Dinh La Thang has said. Thang made the request at a five-hour working session with Prime Minister Nguyen Xuan Phuc in the city on June 27, adding that such a mechanism should be implemented on a trial basis and improved during the process. 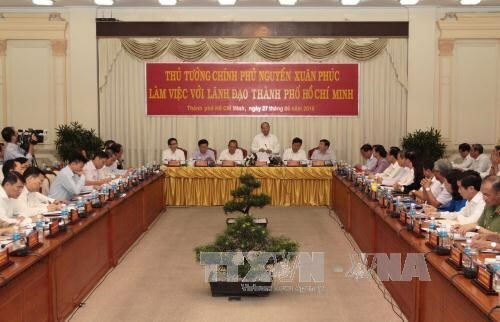 Chairman of the municipal People’s Committee Nguyen Thanh Phong asked the Prime Minister to allow HCM City greater decision making power in seven aspects with a view to facilitating the city’s rapid and sustainable development. He asked for more authority in issuing legal documents to regulate some sectors and fields in accordance with the city’s situation, including the collection of a number of types of fees, the pilot administrative fines on certain violations of social order and safety, and the number of local officials and civil servants. The city also wants its police force to enjoy a specific mechanism on staff number, investment in mechanism and technical means and welfare policies to match the scale and importance of their work in the city. Besides, Ho Chi Minh City hoped the PM will allow it to keep 23 percent of its budget revenue under the current financial mechanism for the next 10 years as from 2017. Prime Minister Nguyen Xuan Phuc hailed the comprehensive achievements that the city has gained over the past time and permitted the city to continue piloting its own measures to deal with newly-arising issues.